Once the Competition Builder module has been switched on it will be accessible via your SOCS control panel. 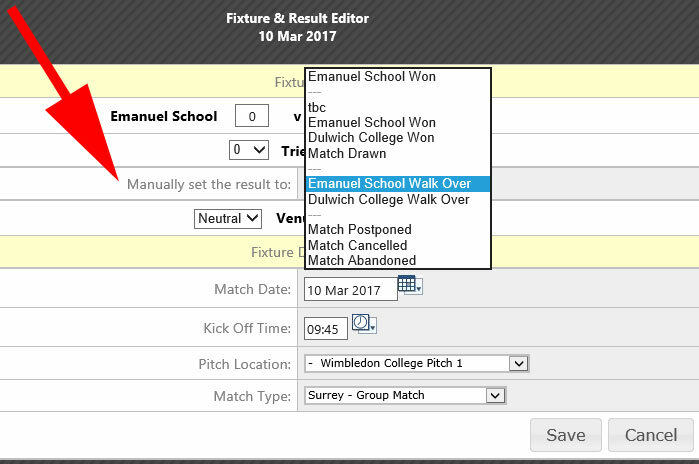 With Competition Builder you can make fixture date, start time and pitch location changes and you can upload results during the competition or afterwards. You can also change team kit and colours for any school not using SOCS. WIth Competition Builder you can also make changes to the format of the competition and you can withdraw teams or make replacements. You can also swap teams between groups. During a competition we recommend appointing someone who is dedicated to uploading results and setting up Phase 2 knockout grids or groups. To access the Competition Builder module, login to your SOCS control panel and from the main menu navigate to the Competition Builder using the Competition Builder menu option. If you have requested a Competition Microsite for your competition then it will be listed with buttons to click through to Competition Builder. Step 1. Login to the SOCS control panel. Step 2. 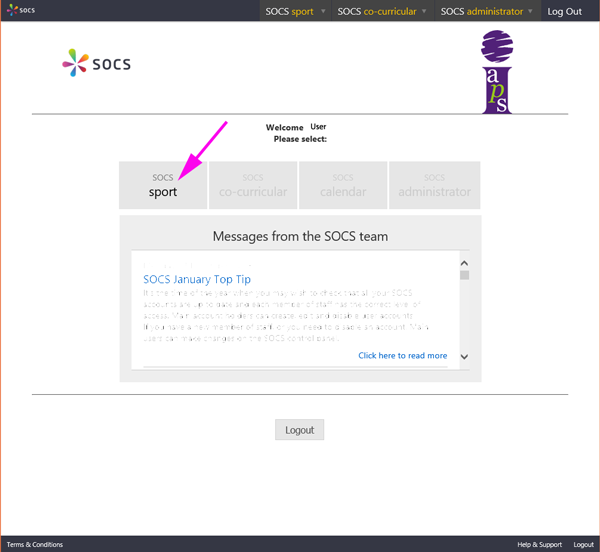 Navigate to SOCS sport via the button shown by the purple arrow below. Step 3. Select the correct Season and then the appropriate Builder button shown by the purple arrows below. Step 4. The Competition or Competitions will then be listed for the selected sport. See screen shot below, which describes the main elements of the Competition Builder screen. 1. Return link to the control panel home page and your Competition List. 2. These are the main controls for the competition where you can change the overall setting, upload news, photos and documents or make change to the map. There is also a link to your Competition Microsite where you can review and check the content. 3. These are the controls for the respective age levels. To edit fixture dates, see Step 3 below. Certain features might be highlighted with a red asterisk *. These are under development and will be available soon. To change Team kit and colours click through on the Paticipation Editor button. You can change the kit and colours of any school not using SOCS. All the fixtures will have been uploaded with default settings for kick off times and pitch allocations. (These are shown as "tbc"). Click the "Edit Fixture" button adjacent to each fixture - see the screen shot below. You can then change the default settings for each fixture accordingly. If the fixtures have not been uploaded then get in touch with support@misocs.com. Step 1. Click the Playing Schedule Editor and then select a Group as shown by the purple arrows below. Step 2. Select a Team from column 1. For example click Felsted Preparatory School, as shown by the purple arrow below. Step 3. Select each opponent in turn from column 2 and then change the default settings and save as shown by the purple arrows in column 3 (Edit Details) below. If the location of the pitch is not listed in the drop down then you should add the pitch location(s) using the map plotter. Ensure to repeat Steps 2 and 3 above for all the teams in column 1 until all the selected group's fixtures have been edited. Ensure to complete Steps 1, 2 and 3 for all the groups. 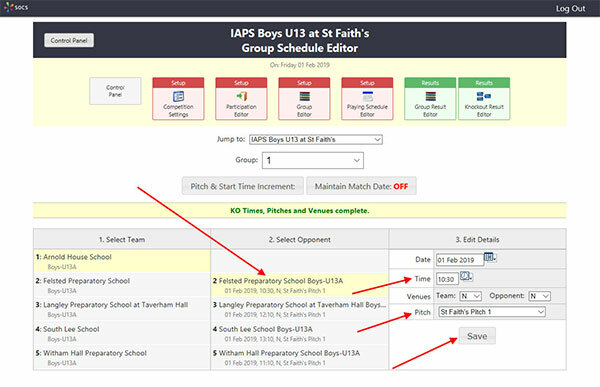 Editing fixtures is normally carried out before the competition takes place as described above - see Creating the Playing Schedule - but if you need to quickly edit an individual fixture during a competition, perhaps to change the KO time or pitch, then follow the instructions below. Step 1. Select the Results Editor and then select a Group, as shown by the red arrows below. Step 2. To edit a fixture use the appropriate + edit button that appears between the teams, as shown by the purple arrows below. Results can only be added on the day of a fixture or competition - if the competition is a one day competition. Login to your SOCS control panel in the usual way (see Accessing Competition Builder here) and navigate to the Competition Builder module as described above. Select a Group or League, indicated by the red arrow above. Select the appropriate + fixture & result editor button, indicated by the purple arrows above. 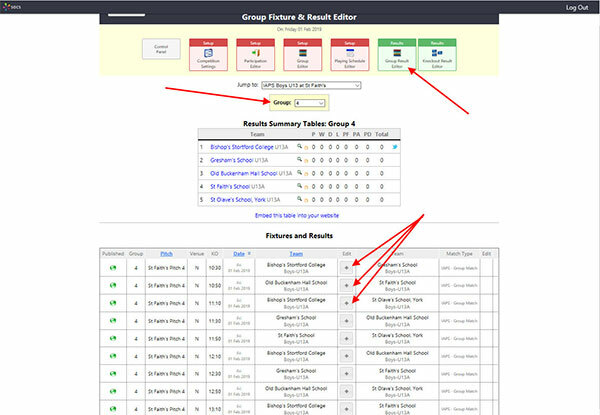 When a result is added the + fixture and result editor button is replaced with the scores and the edit button is relocated in the right hand column. This helps to rapidly spot missing results as the competition progresses. Pitch markers are added to the map during initial setup - fairly randomly if the pitch locations are not firm. All the matches are also geo-tagged to their respective pitch. To see these click through on the Map button in the main menu of the competition microsite or in Competition Builder and then click any of the "Schools playing here" links. With the map plotter you can also add the location of visitor car and coach parking, which is always helpful for staff and parents new to the circuit. You can also send through any changes needed and we will make the adjustments or you can edit the locations using the map plotter. Note: If pitch map markers need relocating then ensure to edit them. Do not add new pitch locations, otherwise any new pitch locations will not be pinned to the matches. If you need help with this then get in touch. Points. The points system for a league or group stage is normally setup with the default settings: 3 points for a win, 1 points for a draw, 0 points for a loss. League Points can be adjusted by us if necessary. Win and loss bonus points can also be catered for. If equal GD/PF then a local rule can be applied, such as coin toss or a penalty shoot-out etc. Important Note: A common misconception is to use the result of any two teams tied in the same position in a league table to decide which team is best, particularly the top two teams if they are tied on league points. This is not strictly correct, as this result has already been taken into account when deciding the league points. If a team needs to be swapped for a replacement team then send the details to support@misocs.com and we will make the changes. If a team cannot be replaced and the entire format of the competition needs to be changed, as can sometimes happen, then send the revised draw and playing schedule to support@misocs.com and we will make the changes. We can remove a team from the competition completely if you send an email to support@misocs.com. Let us know the age level, and team to remove and the name of their group, pool or league. You can add a standard result such as "1-0" or "10-0" etc. You can manually set a result to “w/o” (walkover) – see the illustration below. League points for a “win” are awarded to the team with the walkover and the team that has withdrawn receives league points for a “loss” and will be shown in the playing schedule as “w/d” . (This is the preferred option). 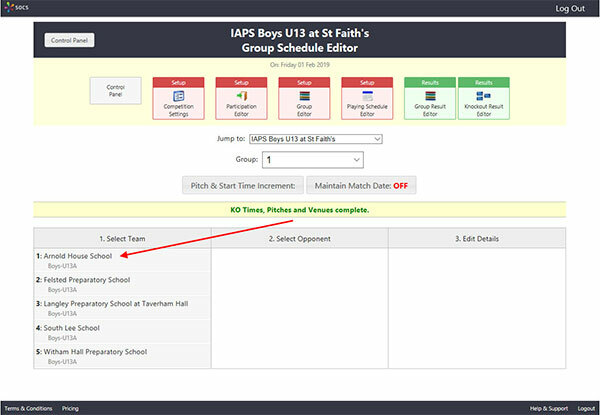 Occassionally schools with SOCS will upload their own competition fixtures rather than editing the existing competition fixtures that already appear in their teams fixture listings. This can cause problems and we therefore recommend that you inform participating schools using SOCS to edit their league/competition fixtures and NOT to add duplicate fixtures, as these will not be pinned to the playing schedules, league tables or knockout grids in the Competition Microsite. If they do accidentally upload duplicate fixtures, they should delete the duplicates they have added. To reduce the risk of schools uploading their own competition fixtures we recommend sending the playing schedule to SOCS before sending it to the participating schools. 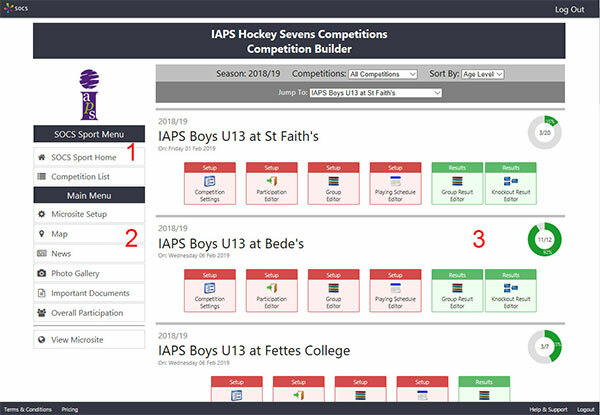 All competition fixtures appearing in the sports website of schools with SOCS are automatically linked to the Competition Microsite and these fixtures cannot be deleted using the Fixture & Result editor from the SOCS control panel. This is to prevent accidental deletion by Schools using SOCS.